Welcome to Bolivia. Crossing into southern Bolivia from Chile across the high Andes. “This is my Land… Bolivia. Welcome!” This sign marked my leap into the unknown, as I left behind friends, warmth and comfort in Chile, and crossed the barren border into the bleak heights of the Bolivian Altiplano, alone. A new country, a new culture, a new altitude; we were greeted at the border post with bags of green leaves. Coca. The infusion, we were told, would take the edge of the soroche – altitude sickness – almost impossible to avoid at 3800m above sea level… and climbing. But in the Altiplano it’s hard to tell if your head is spinning because of the lack of oxygen or the incomprehension of the alien landscapes. Flamingoes take flight over a rust-red lake. A white lake turns turquoise before our eyes as the dawn thaw causes a chemical reaction below the glassy surface. Geysers belch stinking sulphur into the thin, thin air. Snow-topped peaks are revealed to be over 5000m high – yet we are so close to the sky ourselves that they look like hills. This is the roof of South America. Three days in a rickety jeep. Three sleepless, aching nights; three icy dawns with the wonder of the sun rising over the widest horizons I’d ever seen, watching as my own skinny shadow stretched to the distant mountains. A world composed of salt and volcanoes and boiling water and dust, that made me ache for the sight of a green leaf, a blade of grass, a drop of rain. Life. Southern Bolivia is hard. It is a place to marvel at, to respect, to admire the wonders that exist in the world; but rather than enjoy it, I endured it. I’m pleased that I did. This picture tells a story of the Altiplano. It captures the incredible, clear light that I have never seen elsewhere in the world. It reveals the stillness, the sterility, the emptiness. 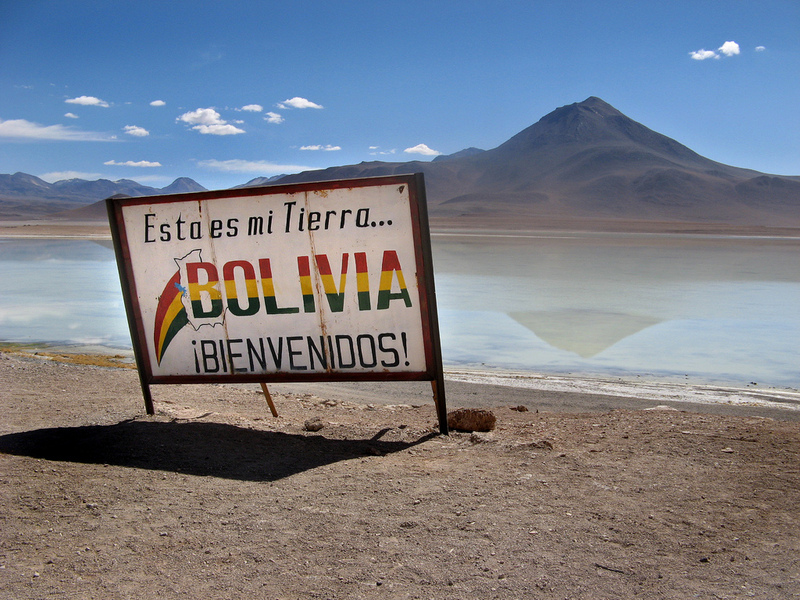 And in the sign it captures the Bolivian resolve: It’s bleak, we know, but… this is our land. Tags: Altiplano, altitude, andes, Bolivia, desert, road trip, south america. Bookmark the permalink.